Corey Anderson had always been known for his powerful striking, but he took it to a new level on New Year's Day 2014 when he broke the world record for the fastest ODI hundred 36-ball blitzkrieg against West Indies in Queenstown which included 14 sixes. It came a time, a few months after he scored a century in his second Test, that Anderson, who would not look out of place in the All Blacks' front row, was suggesting he was ready to fulfill the potential spotted in his a teenager. A record that stood for more than 17 years was finally broken on New Year's day in 2014. Corey Anderson bludgeoned the West Indies bowlers to score the fastest ODI century, off just 36 balls, eclipsing the record of 37 set by a 16-year-old Shahid Afridi in 1996. Anderson finished unbeaten on 131 and such was his savagery that he even managed to overshadow Jesse Ryder, who motored to the sixth quickest ODI century of all time. The pair powered New Zealand to a scarcely believable 283 in just 21 overs. This, after there were fears of yet another washout. Find Corey Anderson profile and stats of batting, bowling and fielding including latest updated news of Corey Anderson, videos and images at Hamariweb.com. Also find detail Player profile and career statistics of Corey Anderson of New Zealand. 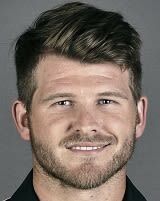 Corey Anderson - Find Corey Anderson of New Zealand Cricket Team complete player profile, number of matches, runs score, wickets & catches, Statistics, Records, Corey Anderson Latest News, Corey Anderson Videos, Corey Anderson Photos, and other Corey Anderson Cricket Team players.